An elderly Nova Scotia man who nearly died on a snow-covered road owes his life to a retired politician who mistook him for a seal. An elderly Nova Scotia man who nearly died during the most recent storm owes his life to a retired politician who mistook him for a seal. Gerald Whitman, 73, left his home in New Glasgow at 6 a.m. Monday bound for the Pictou hospital for dialysis treatment. He found his regular route closed and drove along a detour. "I made a wrong turn somewhere. Right at the beginning, I should have come back home," he said Tuesday. "I thought I recognized the road." The road deteriorated after 15 minutes. Plowing his own path at 30 kilometres an hour, he missed a curve and drove into a mountain of snow. "I couldn't get out the driver's door, so I crawled out the passenger door," he told CBC News. "I had my good mittens on, and my hat that has the ear [flaps], but I didn't put them down because I didn't think I was going to be very long." Snow firmly gripped his car, holding it in place. The senior set out on foot for a house he could see in the distance. "I'd just listened to a CBC program stating that somebody had spent 11 hours in their car. I said, 'I'm not spending no 11 hours in my car,'" Whitman explained. But the snow was deep and his arthritic knees struggled to pump through the drifts. He soon needed a break and sat down. He couldn't get up, so he crawled forward. He knew what would happen if he fell asleep. He pressed on, crawling then resting, advancing over the winter wasteland. An icy wind kept pushing him over, and he kept righting himself. "I wouldn't quit as long as there was a breath in me," he said. His hands went numb and his fingers couldn't get the ear coverings down. "The first 10 minutes wasn't too bad," he said, "but the next hour I was on my hands and knees. In spots where the snow was so deep, my knees and hands would just sink." In other places, he crawled over jagged ice. 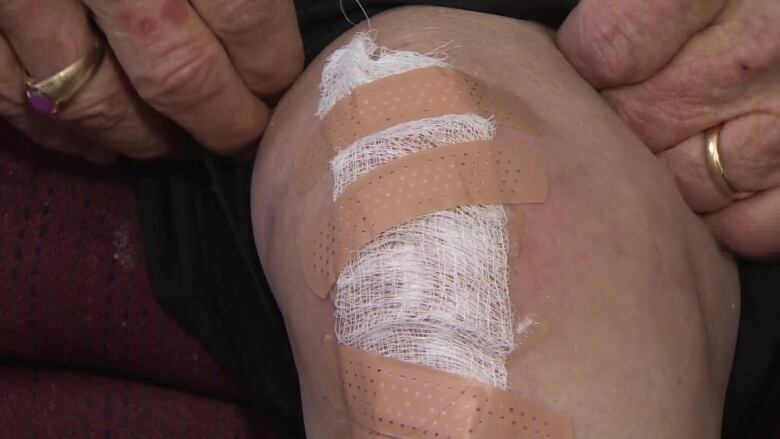 The "crushed rocks" damaged his knees — a pain he only felt when he thawed out. "After about an hour, I thought, 'Well, if this is what it's going to be, this is what it's going to be.' I made peace with the Lord and said, 'If it be your will, so be it.' And I just stopped. Apparently it wasn't his will." Whitman looked up and saw an angel of sorts — retired politician Charlie Parker, who had spotted Whitman while he was out shovelling snow. 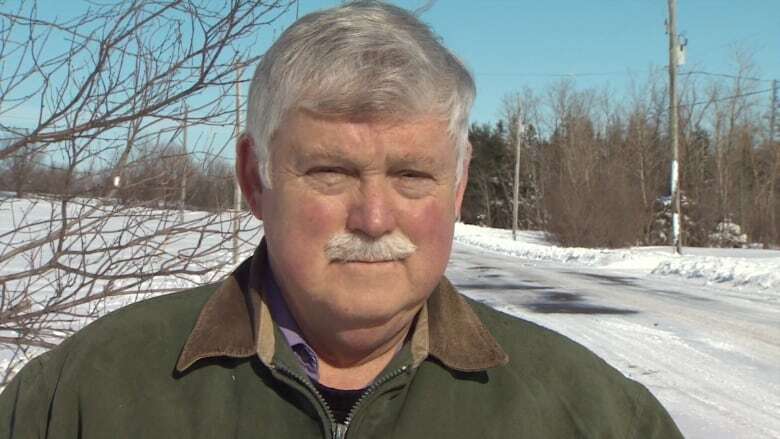 The former NDP provincial cabinet member, who represented Pictou West for many years before losing his seat in 2013, was trying to clear snow from his driveway so his son could get in after a night shift when, in-between snowy gusts, he spotted a long, dark shape 100 metres away. "I thought it might be a seal," he said. After deciding to investigate, he found a man face down in the middle of the road. "I turned him over," Parker said. "It turned out to be a gentleman I knew — he had been my former banker." Parker set about saving the man. He slung Whitman's arm around his shoulders and pulled him along. For the last bit, Parker tried to fetch a toboggan, but couldn't dig it free. He returned and told the elderly man to get up. The two men managed to get to Parker's house where the former politician's wife, Marilyn, and their dog warmly received the visitor. Whitman was covered in heaps of blankets and Parker spooned him coffee, as he couldn't grip a mug. Meanwhile, the Department of Transportation sent a plow to clear the road for the ambulance, which took about 45 minutes to arrive. By then, Whitman was shaking violently and needed medical attention from the paramedics. Parker downplayed his heroics. "I'm sure I didn't do anything different than anyone else would have." "He thought I was a seal. On behalf of all seals, I'd like to thank him for his interest," Whitman said with a laugh. "If he hadn't been as strong as he was, I think we still would be there." In the end, Whitman got his dialysis treatment, and he plans to drive to his next appointment later this week.